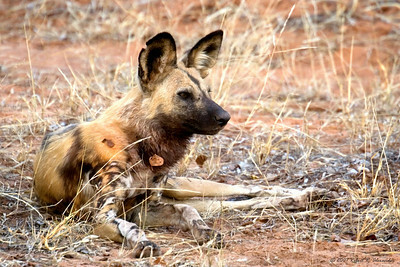 While travelling south of Skukuza in Kruger National Park, I ran across a pack of African wild dogs one evening. 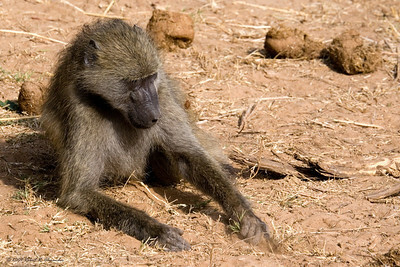 This one wears a radio collar to that researchers can track him. While travelling south of Skukuza in Kruger National Park, I ran across a pack of African wild dogs one evening. There were around 15 or so in the pack and they we quite playful. 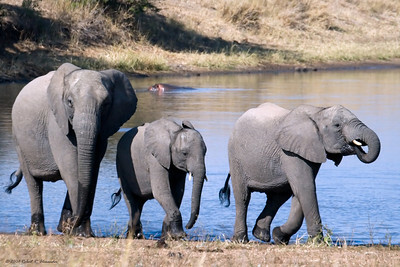 Although they're only distantly related to domestic dogs, their behavior reminded me of them. 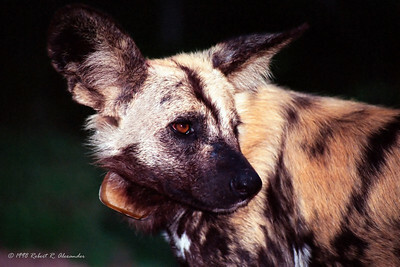 This African wild dog is part of a meta-population pack in South Africa. 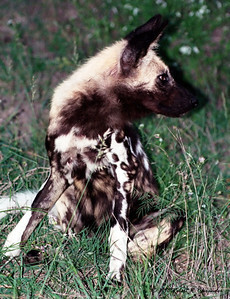 Because wild dogs need more land than is generally available, small packs are supported on private reserves and then mixed over time to maintain genetic diversity. 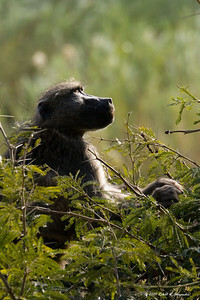 While driving across the Sabi River in Kruger National Park, I came across this baboon sitting on the bridge rail looking out over the water. She had an air of wisdom about her that I wanted to capture. 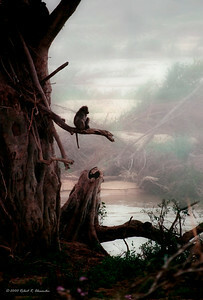 One foggy morning, along the Sabi River in Kruger National Park, I spotted this lone baboon sitting like a sentinel looking over the river. 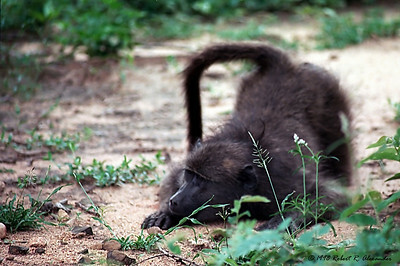 This young baboon was playing with another from the troop. Just like your family dog, he'd frezze with his head down and tail in the air, then suddenly take off when the other approached. 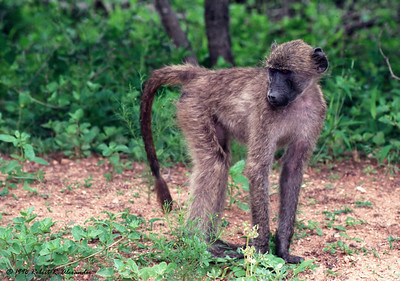 This young baboon in southern Kruger National Park was part of a group running around and playing. 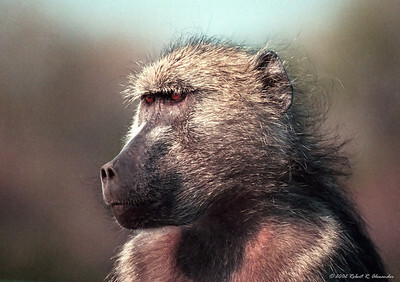 He's looking back at another baboon who is about to jump at him. 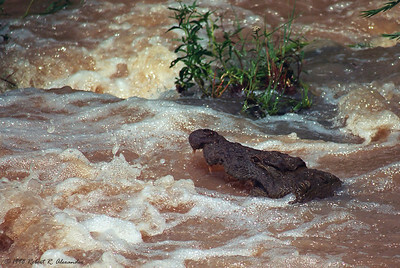 The river was up and lots of water was flowing through the Crocodile River in Kruger National Park. I spotted this crocodile fishing by sitting in the fastest part of the water with his mouth open. Every now and then, a fish would swim in and he'd grab it and eat it. Clever boy! 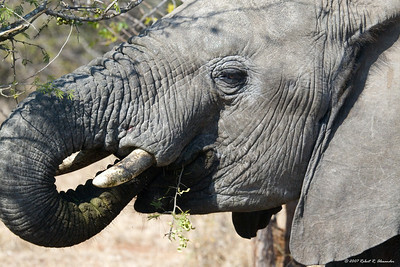 This is one of three young bulls I found near Satara in Kruger National Park. 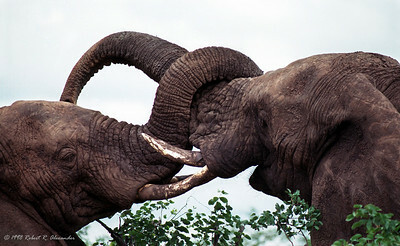 They were quite playful both with each other and with me... a little disconcerting at that size. 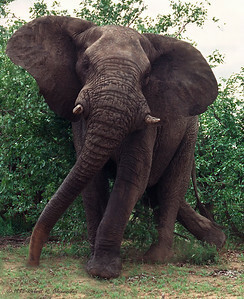 As I was taking photos of the first elephant, I heard a loud cracking sound, as of a large branch being snapped in two. The thing was that the sound seemed to come from behind me out the left side of the car. 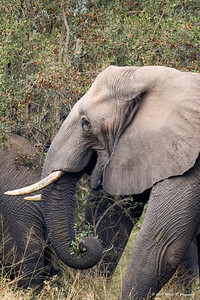 It seemed almost in slow motion that I turned and looked out the passenger window, where I saw only four huge legs, the bottom part of a trunk and two very large tusks. 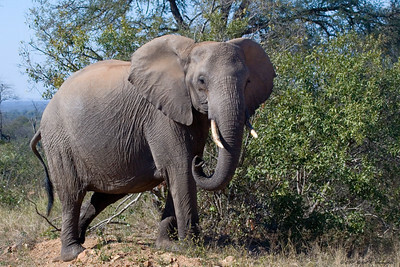 Imagine my embarrassment in being snuck up on by an elephant! This one was a bit agitated and he bluff-charged by vehicle just after this was taken. 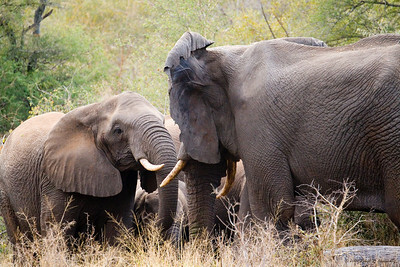 These are two of the three young bulls I ran across near Lataba in Kruger National Park. The one on the right had just bluff-charged me, and then immediately went over to his friend and did this. I couldn't help thinking it looked like a high-five. 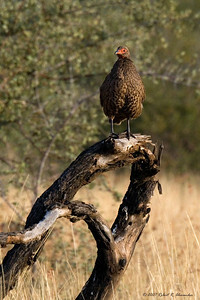 There were lots of these francolins around, but this one was posing so nicely, I just had to stop and take his picture. 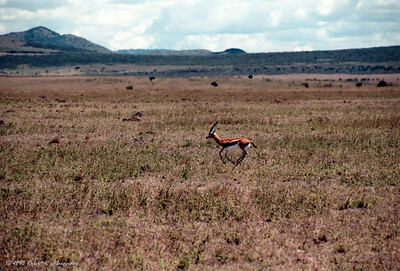 This Thompson's Gazelle, alone on the Sarengetti, was startled by our vehicle and ran alongside us for several seconds. At the time I thought this must be a difficult place to be so small and alone in such a vast landscape, and the photo reminds me of that feeling. 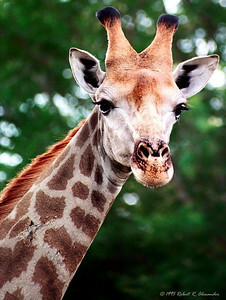 Who couldn't love the amazing shape and beautiful patterns and color of the giraffe. It is one of those creatures that is still hard to believe even as you're looking at it. 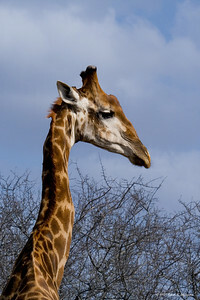 There are several species in Africa that you see a lot of, and the giraffe is one, but I never get tired of watching them. 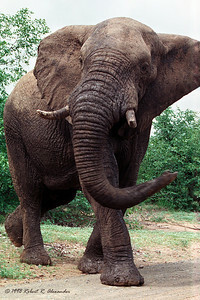 You would think that couldn't walk with a body shaped like that, yet they are incredibly graceful as they move. I've never seen sunsets as intense as those on the shores of Lake Kariba in Matusadona National Park. 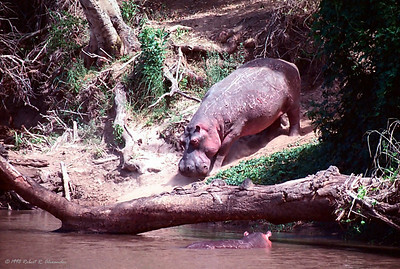 Their large hippopotamus population were usually just offshore each evening adding both visual and sound effects to that best part of each day. 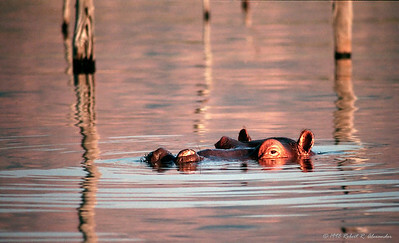 This hippo in Serengeti National Park in Tanzania is working his way down to the water to cool off on a hot day. It seemed like a long and difficult process, which then makes you wonder how hard it is to get back up the bank. 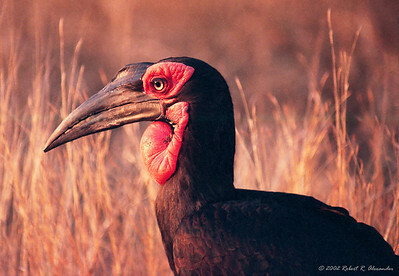 This ground hornbill was searching for food along the roadside at dusk in Kruger National Park. They may not be pretty in a traditional sense, but I love the way the red color from the setting sun plays on his red wattle. The first time I saw a leopard in the wild, I was sitting parked in Kruger National Park at dusk. I had taken this photo about ten minutes before, but by the time the leopard showed up, it was simply too dark for a photo. 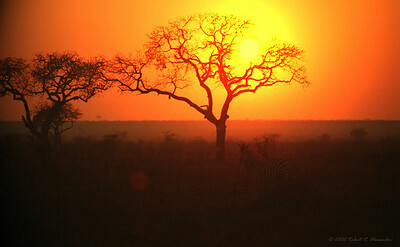 So this is my 'leopard' shot that reminds me of where I was and what I was doing when I saw that first leopard. 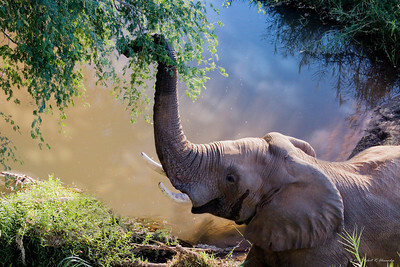 It's still a wildlife shot, though. Do you see the zebra? 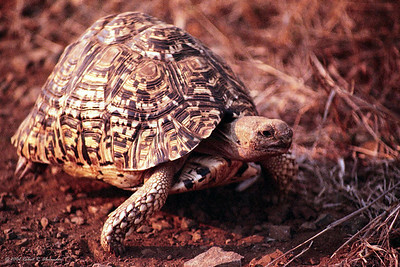 The leopard tortoise is quite common in southern Africa and has a beautiful pattern in its shell. 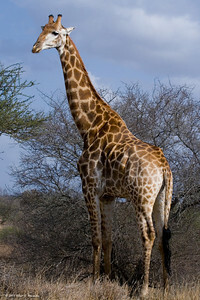 This one was walking along the roadside at dawn one morning. 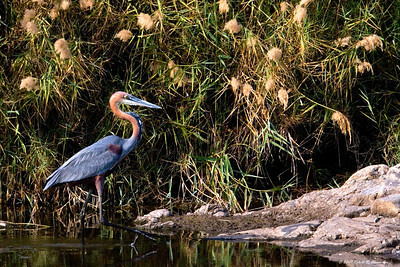 Growing up in Florida, I've seen a lot of beautiful wading birds, but I don't think any are as beautiful as Africa's goliath heron.